Enrique Pino is a traveling advertising and Commercial Portrait Photographer – Cinematographer based in Sarasota Florida. Offering a variety of services ranging from commercial, fashion, editorial and headshot Photography all the way to video productions services to businesses seeking for promotional visual tools. I am a viral campaign designer and I use Photography and Cinematography as mediums to attract attention, make a difference, educate and inspire people. I am not just a Photographer. I am a visual artist with a set of tools. Enrique is a versatile visual media artist covering commercial, fashion, editorial and headshot photography, to video production including promotional, live sports and events. he believes in producing images and video that not only lure and catch the eye of your target audience, but connect to their emotions. People are moved by warm light and dripping colors, the key is to create that connection. In a world of fleeting attention spans, video is a dynamic way to better engage with your audience. Video is a visceral form of storytelling that can break through the clutter and foster positive associations and attitudes toward your brand, products and services. That’s why quality video can put you at the top. 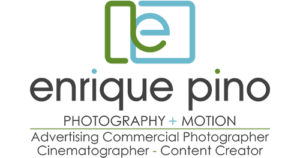 Because of changing market trends and emerging broadcast technologies, Enrique Pino’s Photography is a business of continuous innovation and change, where the mission is to meet the needs and desires of our customers with the most cutting-edge tools. He is passionate about his craft and value it beyond simply creating images or videos. It’s about capturing the moment while adding a new perspective beyond lighting or angles. The love for the art drives him to constantly improve his client’s outcomes by taking risks and being attentive. Sign up for monthly deals, special events, exclusive promotions. I've been photographed by dozens of photographers over the years for my acting and fitness professions and I will say this: Enrique is hands down the one who consistently delivered amazing shots. The action photos are absolutely stunning. The lighting and angles are always perfect. And best of all...he makes you feel completely comfortable in front of his camera. Thumbs WAY up for Enrique Pino Photography. I have had the pleasure of working with Enrique on numerous projects. He is all you could ask for in a photographer: creative, professional, and friendly. He is extremely personable, making you feel comfortable enough to let the real you shine through...and look damn good doing it! Having grown up in a family of photographers, I know how important photography can be for a business, personal brand, or even family memories. I have kept up with Enrique's work for a while but finally had the opportunity to use his services recently. It was an amazing, professional, and relaxing shoot that ended with some high quality photos for my personal business. Can not say enough about Enrique and his talent. If you are looking for a photographer, look no further. I needed professional Headshots for my new startup and I did a search on Google for a Sarasota Commercial headshot photographer and Enrique Pino Photography + Motion had the best reviews and after I took a look at his website I knew he will be the best choice for me. Reasonable prices and even he setup a portable studio at my wear-house. Great experience. Not only Is Enrique professional and friendly but he is also easy to work with. Within the first few test shots I knew I was working with a skilled photographer. As the model this allows you to feel comfortable and focus on getting the “the shot”. I was also impressed with his time management and organization during the shoot allowing it to be a fun experience. I highly recommend using Enrique Pino Photography! I needed a professional headshot for branding and marketing my business. Enrique Pino was recommended by a colleague. Enrique is an experienced photographer who knows what he's doing. He provided an overall excellent experience. Technical excellence and understanding client objectives, combined with an attentive approach to the work, showed his commitment to great results. I'm happy I went with Enrique. Strong recommendation!